Munich - FC Bayern München will be looking to keep the pressure on Borussia Dortmund at the top of the Bundesliga when they face Hannover 96 on Saturday (kick-off: 15:30 CEST). The champions could return to the top of the pile - for a few hours at least - with victory over Mirko Slomka's side, who travel to the Allianz Arena on the back of their best Bundesliga start in 48 years. Hannover didn't exactly have the best of times against Bayern last campaign, losing 5-0 and 6-1 to the record champions in the league. 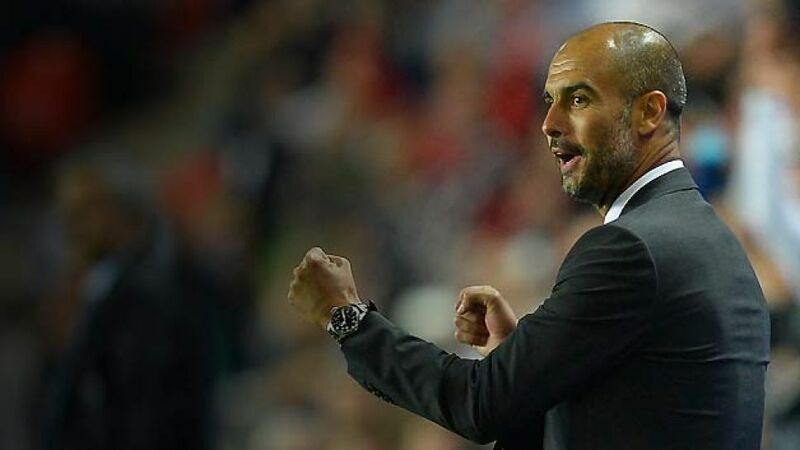 Despite those emphatic victories, Bayern coach Pep Guardiola does not expect Saturday's clash to be easy. "I've learned how difficult the Bundesliga is," said the Catalan. "We have to be able to play in an organised fashion, no matter who our opponents are." Bayern currently trail Borussia Dortmund by two points at the top of the Bundesliga table. The Yellow-Blacks have won all four games so far this season, while Bayern were held to a 1-1 draw by SC Freiburg on Matchday 4. Guardiola, however, is staying calm, insisting they shouldn't be worrying about their title rivals this early in the season. "I don't feel pressure just because we are two points behind Dortmund," he said. "The moment I signed my contract with the club, I knew there would be pressure. We'll see where we are in May." Guardiola revealed Bastian Schweinsteiger could start Saturday's match after recovering from an ankle injury he picked up against Freiburg. "He's taken part in two or three training sessions, but I don't know whether it's enough for 90 minutes," said the head coach. Jan Kirchhoff might be included among the substitutes, but midfield trio Javi Martinez, Thiago Alcantara and Mario Götze all remain sidelined. Hannover striker Mame Diouf picked up an ankle injury playing for Senegal this week, but Mirko Slomka has refused to rule his star striker out of the trip to the Bavarian capital. "Mame has outstanding qualities and is one of the best strikers in the Bundesliga," said Slomka. "If he isn't fit, we'll have to make changes." Skipper Steven Cherundolo and Andre Hoffmann remain unavailable, while Szabolcs Huszti serves the second of his two-match suspension. After their blistering start to the campaign, there has even been talk of Champions League football in Lower Saxony. Slomka is determined not to get carried away, however, admitting Europa League qualification is a more realistic target for his club. "It's up to us to make sure it remains a possibility," he said. "We have to keep our feet firmly on the ground and if we make Europe, we'll all be happy." The outcome of Saturday's encounter will hardly make or break die Roten's season, though. Slomka is fully aware the expectations should never be high when you travel to Munich, but he believes at the same time that his side can take something from the Allianz Arena. "Bayern have to have an off day, while we have to be highly focused for 90 minutes and keep errors to a minimum," he said. "Even if we manage that, it's no guarantee we'll get anything, but the nice thing about football is there are always chances to get at the opposition and to score a goal."